MCSN Danian Douglas/ Navy U.S. Naval Academy Class of 2015 run a squad combat training course during the sixth week of Plebe Summer. Is the term “Indian run” offensive? Master Chief Engineman (SW) Christopher Gary, an equal opportunity adviser at the Naval Academy, thinks so and he’s sent an email urging officers and chiefs at the academy to consider changing the name of the exercise, The Washington Free Beacon reported. 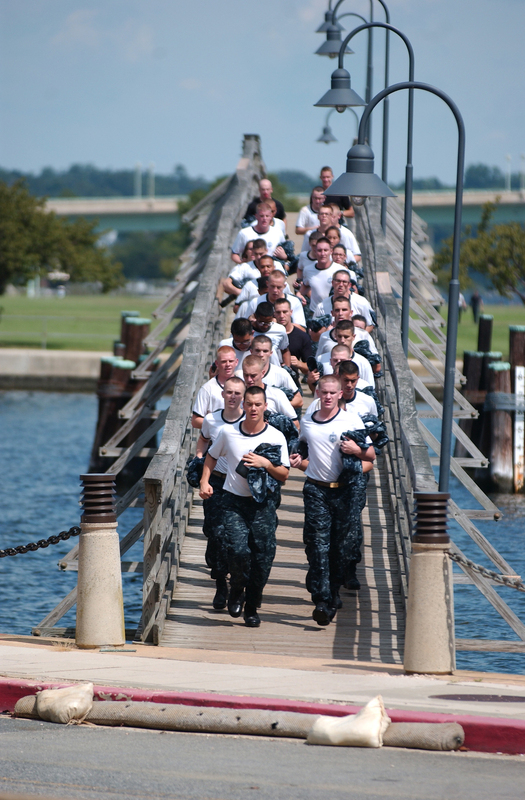 An Indian run involves midshipmen running in a single file line while the last person in line sprints to the front, which is repeated for the duration of the exercise. According to The Washington Free Beacon, Gary said that he received 52 emails in response, many of which suggested alternative names such as back-to-front sprints, leap frogs or squad sprints. Others replied to him and accused him of being the “PC police,” The Washington Free Beacon reported. What do you think? Does Gary have a good point, or is his suggestion too PC? Pollical Correctness Runamock (not Indian lingo I assure you). Mr. Gary is a Master Chief? Guess the Navy has changed alot, and for the worse, since I retired in 2000. Good grief! My military tax dollars are being wasted to fund this useless Chief’s billet? The run roughly replicates the motion on an inchworm. If that’s not already in use for something else then call it that. As to “Indian Run” being offensive mebbe yes mebbe no, but why be offensive if there is no overriding reason to be so — and “tradition” seems a poor reason when there are so many prior examples of poor traditions (which I’m sure you can supply yourself). When I first read this on another news page Gary suggested that other names should be used for the exercise. One of his suggestions was “Leap frogs”. He later changed his mind since “leap frogs” mind offend the french. At that point I thought someone had posted an article from The Onion. If this whole story isn’t a joke then it is a sad commentary about where our military is going. This story originally broke on the CDR Salamander Blog in his weekly Diversity Thursday posting. Using the PC (il)logic that produced this decision, shouldn’t the Navy be changing the rank “Master Chief” to something less offensive? First, there is the word “Master.” How can a person of slavery heritage ever be comfortable with that word? The word “Chief” is could be offensive to Native Americans. Combine the two and you now offend a wide range of people. Just in case anyone thinks what I just wrote is serious, it’s not. But, to avoid offending this particular Master Chief, I will just refer to him as an E9. Political Correctness in most situations (like this one) & others cost more money and more lost time; not to mention it takes away an individuals focus on the exercise or mission when they have to make sure they say things that are always politically correct. I retired as a Chief Petty Officer with 31 years in and I got more and better results from Sailors by giving it to them hard and mean. My play on it is this, and I know this will draw some negative comments, but I could care less about them, so here it is: “I don’t care if the Sailors I’m in charge of like me, hate, me, despise me, etc…etc… I need them to listen to me, be well trained, ready to act in the way they have been trained not be thinking of how to say something so not to offend someone else (OR) listening to others so that they are not saying anything that is politically incorrect!! I am not saying let everyone go wild and say whatever they want. What I am saying is put your ducks in one row!! Mission Accomplishment #1 and if something happens during the mission which needs to be addressed, well then, there is plenty of time to fight, argue & bite off heads afterwards. Sorry I was a little lengthy in my reply but we could really handle these situations whatever they are by simply rearranging our #1 priority which seems to be this Political Correctness. You can’t pick up a copy of Military Times, Navy Times, etc… without reading something about it like this Naval Academy issue. I think the criticism of being the “PC Police” is valid. I don’t think anybody would think the term “Indian Run” is any more offensive that naming a baseball team the “Cleveland Indians”. What is the offensive stereotype anyway? In fact, I don’t even know WHY such an exercise would even be called the “Indian Run”. What is the origin of that name? Who cares! If that’s what they call it – then let them call it that. Big deal! Well – apparently now it *is* a big deal. But it wasn’t until Master Chief Gary decided that it was. Certainly the Master Chief has something better to ponder. Prediction: Nobody is going to care what Master Chief Gary thinks and the exercise will be continued to be called the “Indian Run”. What – are they going to start handing out demerits each time the term is used? Or, will the offender be required to attend some kind of sensitivity training? Pft! The Master Chief has been pushing a pencil on shore too long. It’s time for him to get back out to sea and correct all the shipboard injustices. Somewhere out there is village that is missing it’s “Master Chief”! Oh wait, can’t say “village”. Looks like the Navy will now have to disband or re-name the “Navy Leapfrogs” skydiving team. Uh-oh, the SEALs are now in trouble, I’m offended that they are called “Frogs”. See what happens when we go down this slippery road of PC and offending people!!!! Master Chief, and I use that term lightly, being a retired one myself, you wouldn’t have made it in my day, it’s called “tradition” something you probably know nothing about and must have had your anchors handed to you instead of earned. Get a real job and stop the nonsense! If we call it leap frogs wont PETA have an issue with that? I would like to suggest changing it to Native American Run. As a retired CMC and an Equal Opportunity Advisor myself, I don’t see the term Indian Run as offensive or derogatory in any way. The running form of having the person in the rear sprint to the front or “leap frog” has been used for years, if not centuries as a means to keep the unit moving forward. Everyone shares in the work-load and equally sprints and jogs to help the team meet its objective. It is a very common tactic. The Native American Indians used this technique to chase down quarry, enemies, etc. I used it when doing formation runs as a Navy Diving instructor for years. Political correctness trying to change tradition for the sake of what? There are certainly more pressing issues at the Naval Academy that need to be addressed and fixed long before this non-issue. you gotta be kidding me. Hey Gary, just pay attention to the real EO issues, and there ARE some at the Academy, that we all know TOO well. How about walking the deckplates and ensuring no racial, sexist or homophobic violations are occuring? Another 8 year E7 of course. I see nothing wrong with the words Indianrun, there is nothing derogatory about Indianrun , some people need to get thier heads out of the sand and join the twenty first century ,HELLO ?